Massachusetts has kept a sword hanging over the heads of Native Americans for hundreds of years. That’s a terrible symbol for our state. With the 400th anniversary of the Mayflower landing approaching in 2020, it’s time to change the Massachusetts Flag and Seal. Una imagen de Supremacia Blanca desde el Año 1629.
habitantes que viven en el Commonwealth. 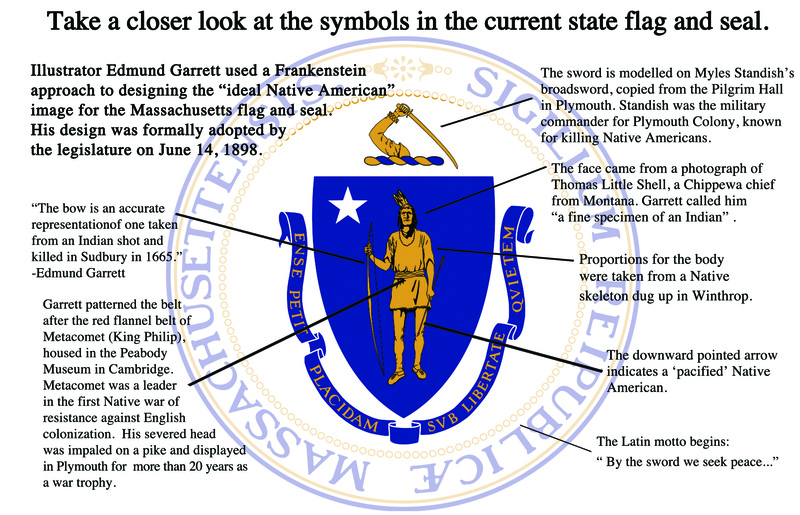 Six Native American leaders will be among 20 members of new special commission empowered with determining how Native images or Native symbols are used on the Massachusetts State Flag and Seal under a bill being filed Friday by state Rep. Lindsay Sabadosa (D-Northampton). The new version of the bill strengthens earlier language by adding more Massachusetts tribal people to the commission and by clearly stating the current symbol of the Commonwealth – a Native American man with a Colonial broadsword over his head – will change!